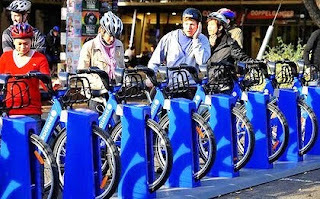 Yesterday, Melbourne became the first city on the Australian continent to begin large scale bike-sharing. Starting with 10 stations and 100 bikes, Melbourne Bike Share will have 50 station and 600 bikes later this year. The service is an initiative of the State Government of Victoria, sponsored by the City of Melbourne and is a jointly operated by the Royal Automobile Club of Victoria and Alta Bicycle Share of Philadelphia. It uses the Montréal, Canada based Public Bike System equipment. The Melbourne program will be extremely important to watch. It is the first large deployment of a bike-sharing system in a country with a mandatory bicycle helmet law. Will this law curtail the spontaneous usage of non-subscribers? Will the need of a helmet discourage usage? Will there ultimately be a work around for bike-shares not to be fined for not having a helmet? The system has a daily rate of $2.50 AU ($2.10 US), a weekly rate of $8.00 AU ($6.75 US), and a yearly subscription of $50.00 AU ($42.00 US) with the first ½ hour usage at no charge and escalating ½ hour charges thereafter. All in all, the system has very reasonable pricing. According to ABC news, the system cost $5.5 million AU ($4.6 million US). Early reports on the first full day of operation state that Melbourne Bike Share is a real hit with tourists. Maps of nearby shops which rent or sell discounted helmets will be available at each station. It's unfortunately a spectacular failure because of the mandatory bicycle helmet law. Other countries are now citing the failure of Melbourne's Bicycle Share scheme as the exemplary case against mandatory bicycle helmets.